The Phillie Phanatic might be the best, but he wasn't the first. Before this city birthed a giant green dancing blob, it had twins, big-eyed, doll-faced, wrapped in blue colonial jackets and tricornered hats. 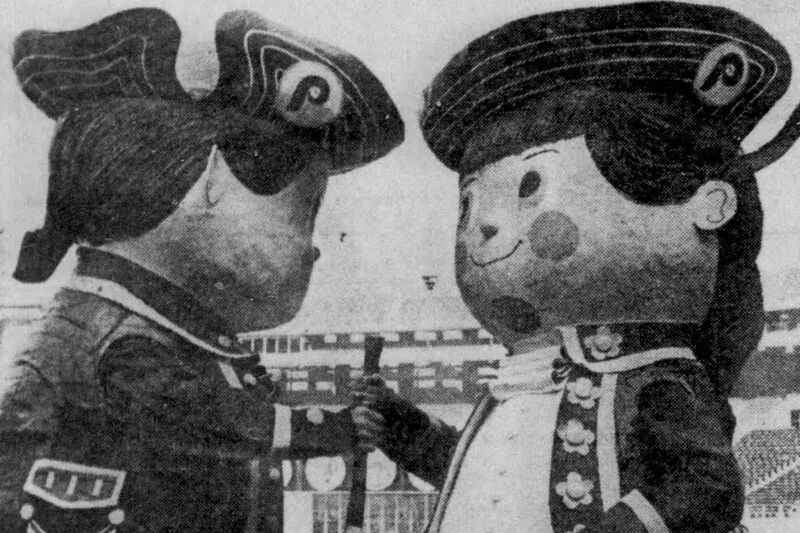 Phillies mascots Phil, top left, and Phillis were an attempt to link the baseball team to the city’s Colonial past. Introduced along with the opening of Veterans Stadium in 1971, the 15-foot animatronic fiberglass mannequins were intended to connect the team and its fancy new stadium with the city's Revolutionary past. But somewhere along the way, as the team grew from perennial losers into eventual World Series champions, the twins were abandoned, and history was made without them. Bill Giles had a vision. In 1970, Giles left the Houston Astros to join the Phillies as the team's director of innovation. In Houston, he had helped orchestrate the notoriously wild entertainment that made the Astrodome famous. "We had a fancy scoreboard, and we showed cartoons, and then we had a home-run spectacular, bells and whistles," Giles, now 82, said in May. At the time, the Phillies were not known for on-field triumphs or midgame entertainment. "When I arrived in 1970, the entire Phillies marketing operation was low-key, to be nice," Giles said. "So I just wanted to stir people up and let the Philadelphia area know that the Phillies were in business, and come see how crazy we might be." As the team planned to open the Vet, Giles decided to develop a home-run celebration similar to Houston's, but on a budget. He turned up the charm, and sold it with his best marketing flair. "When a Phillie hits a homer, Philadelphia Phil will appear between the boards in center field and hit a baseball. It will travel toward the message board in right-center and strike a Liberty Bell," Giles told the Inquirer in 1970. "The bell will glow and its crack will light up. The ball will continue and hit little Philadelphia Phillis in the fanny and she will fall down. As she falls, she will pull a lanyard on a cannon and the cannon will explode. After smoke and sound effects, a Colonial American flag will drop down. Then my dancing waters will come into play to the tune of `Stars and Stripes Forever.' "
On the Vet's opening day — April 10, 1971 — Giles' vision came to life. The sound engineers played new sound effects and animated videos on the new scoreboard, which was the centerpiece of the new multipurpose park. But when third baseman Don Money hit a home run against the Montreal Expos, it turned out Phil and Phillis weren't ready for prime time. The animatronic baseball Phil was supposed to hit was barely visible. The bell failed to light up, and Phillis didn't fall down as originally intended. Worst of all, the cannon smoke didn't appear until minutes after the cannon exploded. "This creation was kind of the poor man's Astrodome," Giles said recently. "We didn't spend nearly as much money." While the electronics under the hood didn't work, the designs of artist Sidney S. Levy, who died on April 7 at the age of 88, were well-received. Giles credited Levy with taking his vision for two 18th-century figures and fabricating life-size plastic ornaments, and later costumed characters more in the Phanatic vein that would interact with the fans. The designs were so good that the team later incorporated them into its logo, from 1976 through 1978. Levy's daughter, Mindy Rosario, said he designed the entire thing, including the bell and the figures. "He was one man who did everything," she said. Phil and Phillis' downfall began with logistics. Vet workers started dismantling the "home-run spectacular" with a few games left in the baseball season after Eagles fans complained that the set obstructed their views during preseason football games. The team started phasing out the twins in 1978. "To be honest about it," Giles said recently, "they weren't terrifically received." "The Phanatic," he added, "was a different story." Up until then teams for the most part would adopt real-life animals or quirky fans as mascots for superstitious players who believed they attracted luck. While Phil and Phillis were more modern, they were still too primitive. And then in 1974, the Famous Chicken started appearing at San Diego Padres games, creating a stir with sophomoric antics and launching a national love affair with cartoonish, costumed mascots at sporting events. Phillies advertisement, in the Philadelphia Daily News on Thursday, May 4, 1972. A few Phillies marketing heads responded with an idea for a furry, green crowd-pleaser of their own. Initially, not everyone was for it. "I was against mascots," Giles said recently. "I felt mascots belonged in high school and college sports operations, and not professional baseball." His marketing guy Dennis Lehman — now vice president of the Cleveland Indians — convinced Giles otherwise. "He said it would help security, and kids would love it," Giles said. On April 23, 1978, then-Phillie Tim McCarver was a guest on the children's program Captain Noah and His Magical Ark, and he brought a friend, a Sesame Street-like character dubbed the Phillie Phanatic. A few days later, on April 25, the character debuted at the Vet during a game against the Chicago Cubs, which the team won, 7-0. It was a much better debut. Thirty-nine years later, the Phanatic remains one of the most beloved and recognizable mascots in professional sports. So, what happened to the twins? "I remember when we decided to take that down, we said, 'What in the world are we going to do with them?' " Giles said. "So we put them up for auction for charity, and I remember somebody bought the cannon, and somebody bought Phil and Phillis, which I believe was an automobile dealer in, I think, Woodbury, N.J., and he had them on display in his place of business." In 1981, John Fricano Sr., whose family owned the Storybookland family theme park just outside Atlantic City, was driving by a Dodge dealership on the White Horse Pike when he spotted the twins in front and pulled over to make a deal. "My mother was a doll collector," said his daughter, JoAnne Fricano, who now runs the park that has been in her family for more than 60 years. "She thought they looked like Raggedy Ann and Andy, and that's what she was going to do with them. But they're still Phil and Phillis." True to their twindom, Phil and Phillis have remained inseparable as fixtures at the 20-acre park on the Black Horse Pike. They sit in a fenced-off display near the Mother Goose characters and amusement rides, with a set of original Veterans Stadium seats between them. "They were such unique figures," John Fricano told the Daily News in 2001. "People remember them, and they're conversation pieces." Despite his initial reluctance, Giles said he now remembers the Phanatic better. "I have a tendency to remember things that worked out well," he said.